A Press Release is an official statement issued to give information on particular matters e.g. Video Games! Here is the official Press Release for Retro Candy Kid and its full implementation with the assistance from @PhilipGHarris [writer, developer, designer] using MailChimp to distribute the Press Release accordingly. Campaigns Campaigns are how you send template emails to the contacts in your MailChimp list. Templates A template is an HTML file used to create the layout and basic design for a campaign. Lists A MailChimp list is a powerful and flexible tool that helps you manage your contacts. Reports MailChimp reports analyze clicks, opens, subscribers’ social activity, e-commerce data. Generate iOS promo codes: Log in iTunes Connect. 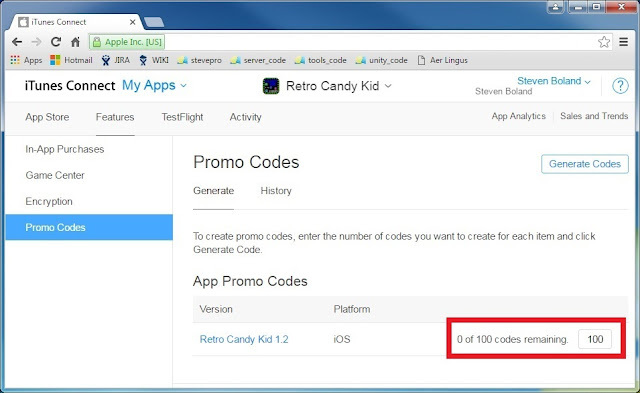 Select My Apps | Candy Kid | Features | Promo Codes. Enter a number of Promo Codes required for Press Release (e.g. max 100) | Click Generate Codes button. Check "I have read and agree to the terms presented above". Generate Codes and download as a txt file. Next page: View subscribers | Import subscribers | CSV or tab-delimited text file | Next | Upload CSV file. Browse to CSV file and Check "I understand that my billing plan may be automatically upgraded" | Next. Match any unmatched columns: "Make a Selection" | New column name | e.g. COUPON | Save | Import. Finally, ensure columns can be used as placeholders in Template: Settings | List fields and *|MERGE|* tags. Ensure the "Field label and type" values are aligned to the "Put this tag in your content" values! IMPORTANT: tags have maximum 10x characters thus better use "COMPANY" instead of ORGANIZATION. Retro Candy Kid is a top-down maze chase video game inspired by the 8-bit title "Candy Kid". Candy Mama enemies are always out to get you as you try and eat all the candy to complete the level. Simple! Retro Candy Kid is available on mobile platforms (iOS / Android / Kindle) and PC. - All 100x levels are unlocked. - Double bonus pts available. - Giant candy for extra lives. - Free man every 20,000 pts. - Open tunnels or closed exits. - Avoid trees or Death trees. - God mode for invincibility. StevePro Studios is an independent game developer that builds and publishes 80s retro arcade video games! The studio was founded by Steven Boland "SteveProXNA" in January 2007 as a "one man team of one" and is currently based in Dublin, Ireland. The original 8-bit title Candy Kid was a "type-in" video game published by New Zealand's Sega Computer Magazine in the September 1984 issue, pages 17-18. Inspired by the Sega Retro Gaming scene, "Candy Kid" was re-written as "Retro Candy Kid" by StevePro Studios in September 2015. Note: *|COUPON|* placeholder in the Press Release text will be substituted with promo code from list. Note: leave all checkboxes unchecked except the Personalize the "To" field. Set *|FNAME|* for recipient. Next Template | Next Confirm | Review summary all correct. Finally, Prepare for launch and Send Now! 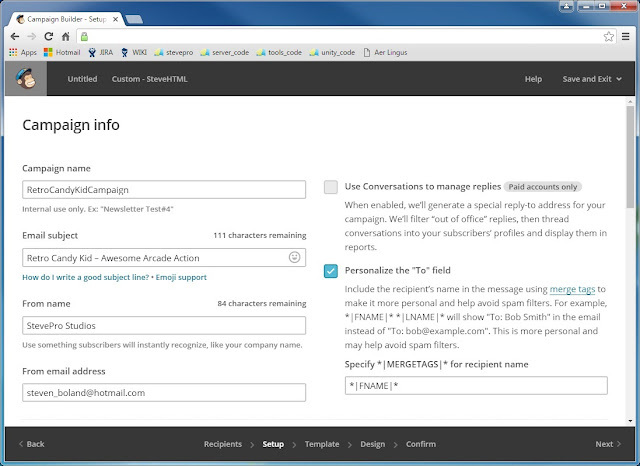 Note re-send: MailChimp | Campaigns | Click "View Report" dropdown to right of Campaign | Replicate. After campaign is successfully sent, the main Dashboard will report all activity; which includes: 24-hour performance, Top links clicked, Subscribers with most opens, Top locations by opens and much more...!